What a joy to revisit an old classic and find that the tour is as fresh and spectacular as the original Broadway production (now closed). (Seen on tour at the Wharton Center, East Lansing, MI 10-21-12). 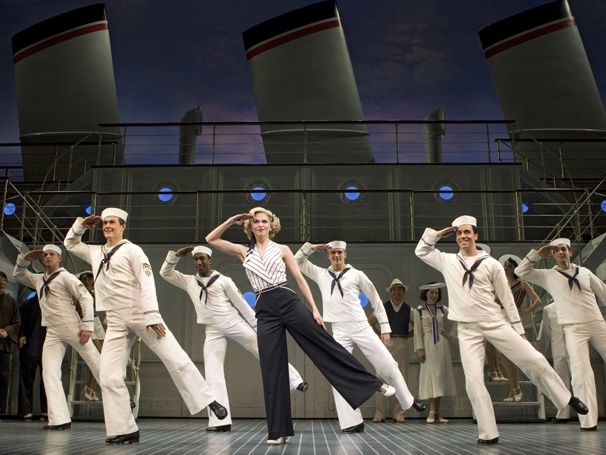 Starring Rachel York in a simply wonderful performance, the dance-laden show veers from joke to song to dance with an ease that one usually doesn’t associate with this creaky old Cole Porter vehicle from the 30’s. Marshall directs with a good eye for modern-day audiences, and the show zips along in a manner that defies its 2:45 runtime. York is magnificent singing, dancing, pratfalling, and tapping her way through all those numbers. Also in the tour, is UM grad Alex Finke who is excellent as Hope Harcourt. Billy is played with dancing and comic skill by Erich Bergen. When Erich and Alex are together, or when Erich and Rachel are together on stage, its sheer musical theater heaven. They are supported by an excellent cast, in fact, one which I like more than the original Broadway cast. Fred Applegate is particularly superb as Moonface. I know, I know — most of my readers have either seen this show a million times, or like myself been IN it a million times…but this is a revival that is stunning in its simple, straight-forward “lets show them a good time” cheer; that the choreography is some of the best in recent years makes it a must see. Sad I missed it in New York! Hope to see it on the tour now that I read this.